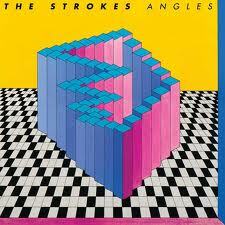 Which brings me to the latest offering from The Strokes, their first in five years. When they released Is This It? (an album that made my Favorite Albums of the Oughties list), they were a breath of fresh air (or, perhaps more appropriately, stinky garage air). With sharply, simply strummed guitar chords over a drummer and bass player who seemed locked together, plus Julian Casablanca singing through a megaphone, they made garage rock cool again, the energy and enthusiasm, plus some catchy melodies, overcoming a lack of serious musical chops. Have they learned to write songs and play better? Yes and no. Angles is a mixed bag. It starts strongly on “Machu Picchu,” with a dub reggae-influenced bass, and a nice squeaky guitar riff. “Under Cover of Darkness” continues this trend with a classic Strokes bass and drums combo, and a nice guitar figure over top. “Gratisfaction” also captures a bit of the old Strokes spirit. “Two Kinds of Happiness” showcases some improvement in musicial ability with some snazzy (if occasionally strained) guitar playing and nice tom-tom work by drummer Fab Moretti. It doesn’t always work, as “You’re So Right” demonstrates, a song that tries but doesn’t quite succeed at getting off the ground. There’s also some absolute crap here, such as “Call Me Back,” which doesn’t seem complete. “Metabolism” doesn’t go anywhere. Neither does “Life is Simple in the Moonlight.” “Games” is like some failed 1980’s experiment (and what’s with the annoying background percussion?). I’m an album guy in a digital age, so it pains me to write this, but you don’t need to buy this entire album. Just buy the tracks worth listening to, and ignore the filler songs that never get it together. I listened to this online via Ashcroft’s website – and I kept thinking: “Did they make a mistake and release the demos instead of the actual album?” It seems so, well, amateurish. I kept waiting for songs to emerge from the sludgy neo-soul. Most of the tracks are virtually without melody, a kind of endless series of notes in search of something coherent. Now, it’s not unusual for me not to like an album, or at least not to feel strongly about it on a first listen. For that reason, I listen to every album at least three times before making any judgments. That was very difficult in this case as I had trouble getting through this once, let alone three times. But I did hang in there and guess what? Nothing changed. I just don’t get what he’s trying to do here. Aside from the lack of melodies and/or songs, Ashcroft’s voice is part of the problem. I’m not sure any vocalist could help this material but his voice seems singularly unsuited to this type of music, slightly nasal and lacking the very soul needed for most of these songs. Listen to “Born Again” for an example. It’s not a complete disaster. When he drops the attempt to play all sorts of other music and plays what he knows best, such as on “She Brings Me the Music,” the results aren’t bad (although even this song falls apart at the end). “Royal Highness” is okay as well, with a nice string bit and a coherence lacking in most of the other songs. My advice: listen to the stream before buying. For all I know, I’m the only one who feels this way but I can tell you (in case you didn’t guess) that I’m not buying this album.